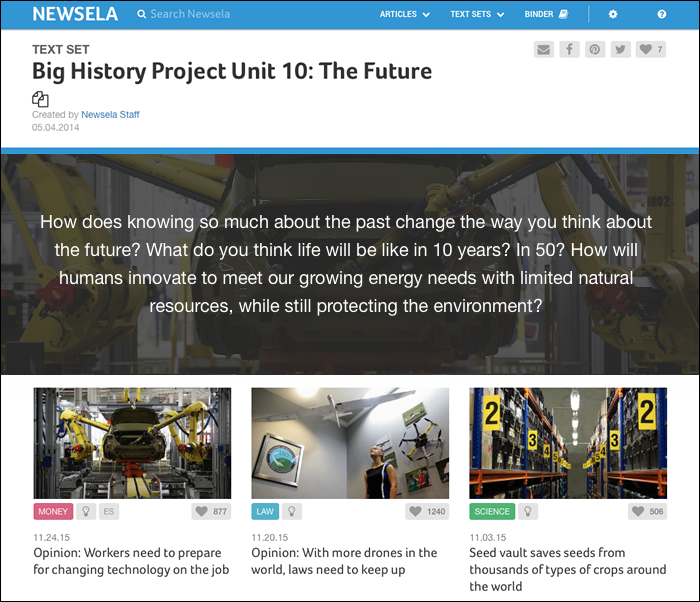 In 2014, the Newsela editorial team worked with the Big History Project to adapt its fascinating articles into multiple reading levels, just as we do with the news content we provide on Newsela.com every day. All our editors agreed: working on this project made us smarter. Not only did we get to brush up on the last 13.8 billion years, but we also began thinking about the daily news stories we were publishing in a much grander context. For instance, a recent article about college students trying to grow plants in Mars-like soil (inspired by Matt Damon in the film “The Martian”) made us recall what we learned in Unit 5 about the unique conditions that make Earth so hospitable. A report about modern-day slavery in the Southeast Asian seafood trade reminded us of what we learned about the Columbian exchange and how it drove inequality among peoples, and devastated Africa (Unit 8). We decided to make our thinking visible and group together the Newsela articles that relate to the BHP units by using our Text Set feature. 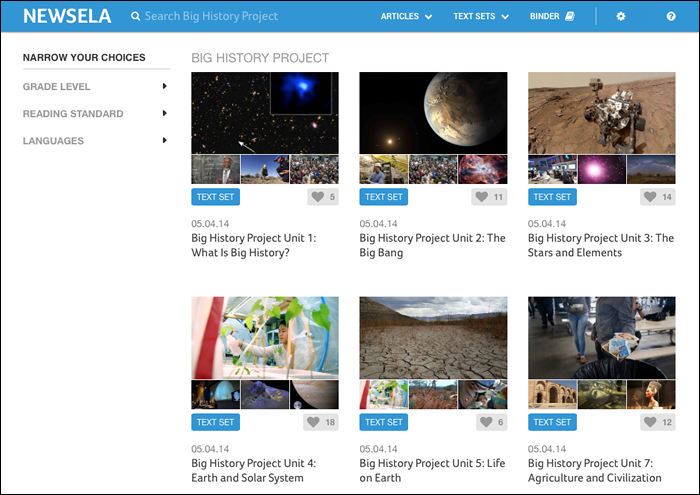 In May, we put together a suite of Big History Text Sets and they’ve grown and thrived since then. One of the latest additions to our text set on Unit 7 Agriculture and Ancient Civilization asks: is Queen Nefertiti buried behind the tomb of King Tut? There is still so much to discover about our past, but new technologies are making it possible to solve ancient mysteries. And then we turn our eyes forward and wonder: What does the future hold for us? If the articles we’ve recently added to our text set on Unit 10: The Future are any indication, we may be shifting from the Anthropocene to an age when smart machines make humans obsolete. Current events move fast and it doesn’t take long before the story of the day becomes… well, old news. Connecting these articles to these enduring themes greatly extends their so-called shelf life. Symbiotically, news articles can be a way to bring a sense of urgency and real world relevance to students as they seek to make sense of these massive themes. We invite you, the educators who are deeply immersed in these themes and thresholds, to share with us the connections you see between Big History and the events that are unfolding in the world. If we have articles on these topics, we’ll add it to our text sets. If we haven’t covered them, drop us a line at editor@newsela.com, and we’ll publish them. 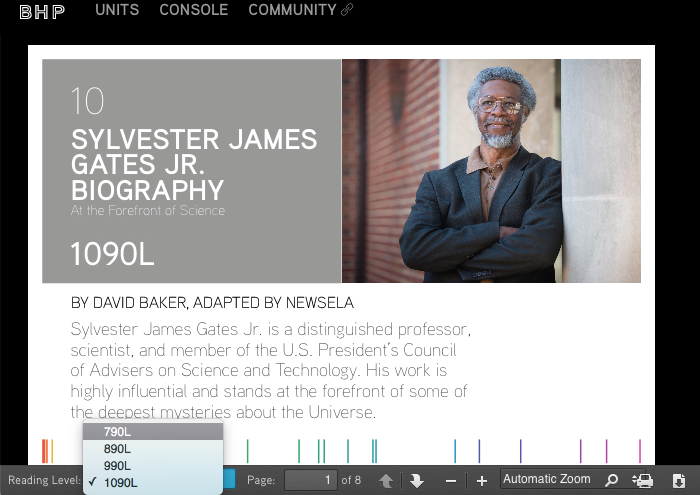 Together, Newsela and BHP hope to inspire students to think beyond their current situations, environments and cultures and think, for lack of a better word—bigger. Human history is microscopic when we compare it to the history of our Universe, but we are fortunate to be more connected than ever, and able to watch history’s slow progress through the news we deliver every day.